I just finished my first official Spoiled Rotten Homes project – an indoor play scape – for little Beau. As I’ve gone through the process of starting this business, there have been a lot of ups and a few downs, but I realized something very special as I went through this first experience with a family outside of my own. There is pure joy in this that is unparalleled to doing residential remodeling. I was at Beau’s house multiple times to build his “Fishin Shak.” Each time I got there, he ran up to the door, super excited, and told me about his day and how much he loved the playhouse. He’s only 2 years old (so he can be a little hard to understand) but the joy and excitement he showed spoke louder than his words. As we continued our work and the structure took shape, the smile never left his face and his excitement was contagious to all of us. The crew, his mother, his brother – we all felt his excitement and shared in his enthusiasm. It was such a rewarding feeling. I think the highlight for Beau came after the electrician installed the light switch inside the playhouse. He turned the switch on and off approximately 53 times, giggling with each flip and telling us how awesome it was! My motivation to start Spoiled Rotten Homes was obviously for my daughters. I saw how the girls' playhouse encouraged family time and saw the joy on their faces as they played. I wanted to bring that to other families, as well. In the few days that I was at Beau’s house, I watched his brothers, mother, and his grandmother (who painted the awesome tree mural on the wall and signed it “Love Grandma”) experience that same family togetherness that was so special to me and my family. It was pretty amazing. I was always taught it’s more rewarding to give than to receive. Based on what I witnessed at Beau’s house and the expressions on everyone’s faces as he played in his new playhouse, I can attest that is true. Maybe I got lucky having such an amazing family as my first Spoiled Rotten Homes customer. Or maybe this is a glimpse of what’s to come when we build playhouses for others in the future. Either way, I’m really looking forward to the next Spoiled Rotten Homes project! Spoiled Rotten Homes Inc. was born. You could say it happened in an instant of fame, or you could say it was built through decades of building a business from the ground up, or having the life changing moment of holding the girls in the delivery room. The playhouse has been a central point in our family. It is where we eat meals, where we have birthday parties, and where Jenny teaches the girls letters. We don’t allow technology in the playhouse. It’s an imagination zone only. 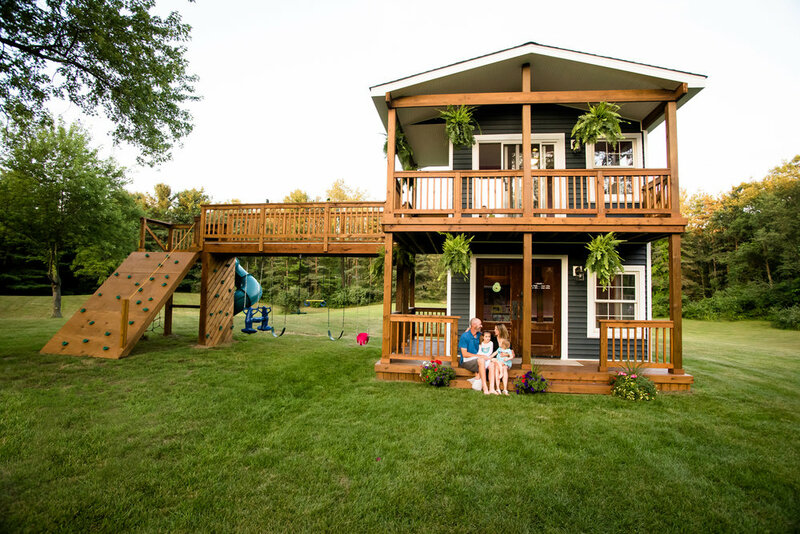 You don’t need a playhouse to love your family, but let’s face it, a big playhouse is really freaking cool. 5 years ago, my daughter, Avery, was born and she rocked my world. She was the most beautiful thing I had ever seen in my life. A few years later, Violet was born. She was beautiful too, even if she did cry for the first 4 MONTHS of her life. I knew that I wanted to change the world for them, to make it as amazing as I could. About two years ago, I saw an opportunity. I found a giant green slide at the side of the road and I had some extra framing. I thought, “Why not a playhouse? I have the wood!” So, I started. As I finished framing, I thought to myself, “I have seen other dads do amazing things for their daughters, but I’ve never really done anything special for mine. I want to do something that they will remember forever.” That’s where it maybe got a little out of hand. It got a little bigger, suddenly had electricity, crown molding, and custom wood pieces that I made out of the raw wood from a local sawmill. And, of course, a rock climbing wall, because every dream playhouse needs a rock climbing wall. It took a year to build, working many late nights and weekends in between operating my business, ATB Building. Avery became my helper, running out to the playhouse to help her daddy in any little projects she could. She loved it and I loved it, too. It was a really special time for us. After the playhouse was finally built, my sister, Aunt Rachel, came over to help decorate and take pictures. I think this is when Avery finally realized what it was—a house for her and Violet. She was so excited and she had a hand in everything that we put in it. A mirror was hung and she had to look into it. A picture was hung and she stared at it. The couch was put in and she had to sit on it, and invite the whole family, too. When dinner came around, the entire family HAD to eat in the playhouse at the miniature table I had built (it was a very tight fit for a 6’4 man). But the pizza was good—even the plastic pizza Avery served. Avery, Violet, and their mom, Jenny, spent the rest of the summer in the playhouse. When Avery and Violet woke up, they ran right into the backyard and made a beeline for it. Breakfast, lunch, and dinner were served at the miniature table for months. People say, “Follow your dreams.” It’s a great saying, but actually following your dreams is scary. If I try, will I fail? Will I disappoint those I love? I wanted to create a princess-like dream for my girls, but in real life, fairy godmothers don’t stop by and build castles. That was up to me. When I started out in life, I didn’t think that I wanted to be a “glamorous contractor.” I was a guy with lots of siblings and no college fund. I needed to make a career choice. I fell into contracting, but ended up liking it. It had a creative side that I hadn’t anticipated. Building my business, ATB Building, has been difficult, but also rewarding. In the past few decades, I’ve been the contractor guy doing everything from complete kitchen remodels, to custom decks, to complete interior overhauls, to building houses. My favorite jobs have been those that gave me creative license for custom work. I am hoping that following this dream of Spoiled Rotten Homes Inc. will make my wife and daughters proud of what I have done someday. With the help of you and the support of my friends, I believe this is possible. I will be updating my blog during this journey, and I’m hoping it will be a fun and rewarding one! Otherwise, you will see a viral story gone bad. Now for the Jerry Maguire moment…who’s coming with me!?!? Welcome to Spoiled Rotten Homes! We are the home of luxury playhouses! 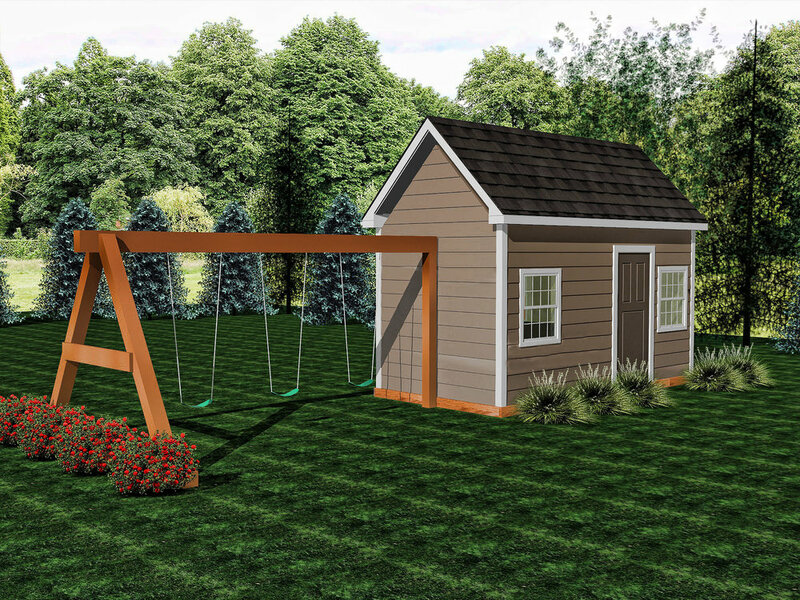 Stay tuned for posts about home improvement tips, Spoiled Rotten Homes projects, and stories about our playhouses!